نوابیان, مریم, جلیل‌نژاد ماسوله, نرگس, اسمعیلی ورکی, مهدی, بیگلویی, محمدحسن. (1395). شبیه‌سازی چرخه نیتروژن در مدیریت‌های مختلف مدت زمان اعمال کود اراضی شالیزاری با استفاده از HYDRUS-1D. نشریه آبیاری و زهکشی ایران, 10(6), 723-731. مریم نوابیان; نرگس جلیل‌نژاد ماسوله; مهدی اسمعیلی ورکی; محمدحسن بیگلویی. "شبیه‌سازی چرخه نیتروژن در مدیریت‌های مختلف مدت زمان اعمال کود اراضی شالیزاری با استفاده از HYDRUS-1D". نشریه آبیاری و زهکشی ایران, 10, 6, 1395, 723-731. نوابیان, مریم, جلیل‌نژاد ماسوله, نرگس, اسمعیلی ورکی, مهدی, بیگلویی, محمدحسن. (1395). 'شبیه‌سازی چرخه نیتروژن در مدیریت‌های مختلف مدت زمان اعمال کود اراضی شالیزاری با استفاده از HYDRUS-1D', نشریه آبیاری و زهکشی ایران, 10(6), pp. 723-731. نوابیان, مریم, جلیل‌نژاد ماسوله, نرگس, اسمعیلی ورکی, مهدی, بیگلویی, محمدحسن. شبیه‌سازی چرخه نیتروژن در مدیریت‌های مختلف مدت زمان اعمال کود اراضی شالیزاری با استفاده از HYDRUS-1D. نشریه آبیاری و زهکشی ایران, 1395; 10(6): 723-731. کودهای نیتروژن مورد استفاده در کشاورزی یکی از عوامل مهم آلایندگی محیط زیست و منابع آب محسوب می‌شوند که استفاده از مدل‌های شبیه‌ساز جهت شناخت چرخه حاکم بر آن‌ها می‌تواند نقش بسزایی در کنترل و کاهش آلایندگی محیط زیست داشته باشد. در اراضی شالیزاری به دلیل شیوه مدیریت آبیاری و ایجاد شرایط غرقابی، چرخه نیتروژن از پیچیدگی زیادی برخوردار است. در این پژوهش برای بررسی چرخه نیتروژن در شرایط مختلف مدیریت اعمال کود شامل 24، 48 و 72 ساعت زمان ماند کود در کرت و سپس رهاسازی آن از انتهای کرت از مدل HYDRUS-1D استفاده شد. برای شبیه‌سازی چرخه نیتروژن در کرت‌های اراضی شالیزاری از میکرولایسیمتر استفاده شد. بافت خاک مورد آزمایش لوم‌رسی‌سیلتی بود و پس از اعمال کود اوره و تیمارهای زمان ماند کود در کرت، مقادیر غلظت آمونیوم، نیترات و نیتریت به مدت 4 ماه (خرداد الی شهریور) در دو عمق 15 و 30 سانتی‌متری اندازه‌گیری شدند. ضرایب تبدیل آمونیوم به نیتریت، نیترات‌زایی و نیترات‌زدایی در عمق 15 سانتی‌متری بیش‌تر از عمق 30 سانتی‌متری به دست آمد. مدل توانست آمونیوم و نیترات را با دقت بیش‌تری نسبت به نیتریت شبیه‌سازی نماید به طوری که ضریب همبستگی مربوط به شبیه‌سازی ‌آن‌ها به ترتیب 79/0، 70/0 و 60/0 به دست آمد. در عمق 30 سانتی‌متری ضرایب تبدیل آمونیوم به نیتریت و نیترات‌زدایی از تیمار مدیریت کود تاثیر نپذیرفت. Nitrogen fertilizers used in agriculture are a source of environmental and water resources pollution and using simulation model to recognize its cycle could be important role to control and reduce environmental pollution. In paddy fields, nitrogen has complex cycle due to irrigation management and submerged condition. In this study, HYDRUS model was used to simulate and study nitrogen cycle under different fertilizer management treatments including 24, 48 and 72 hours remaining duration of fertilizer and releasing it by runoff. Micro lysimeters were used for simulating the nitrogen cycle in paddy field. The soil texture of this experiment soil was silty clay loam and after applying the urea fertilizer and treatments of the research, ammonium, nitrate and nitrite concentrations were measured for 4 months (June to September) at depths of 15 and 30 cm. Changes rate of ammonium to nitrite, nitrification and denitrification was obtained more at depth of 15 cm than depth of 30. Model could be simulated ammonium and nitrate more accurately than nitrite so that correlation coefficient of simulation were 0.79, 0.70 and 0.60, respectively. At a depth of 30 cm changes rate of ammonium to nitrite did not affect by fertilizer management treatment. 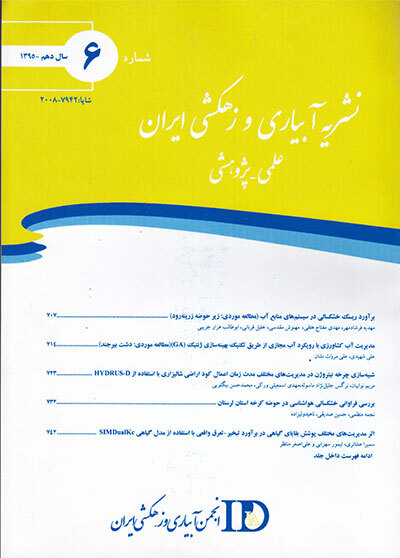 شیرانی،ح.، م. کرد،غ.، صیاد،ع و نقوی،ه. 1390. شبیه‌سازی حرکت برمید در ستون‌های دست‌خورده خاک با استفاده از مدل HYDRUS-1D. پژوهش‌های آبخیزداری. 92. 21-31. Abichandani,C.T and Patnaik,T. 1955. Mineralizing action of lime on soil nitrogen in waterlogged rice soils. Int. Rice Comm. Newslett. 13: 11-13. Chotpantarat,S., Limpakanwech,C.H., Siriwong,W., Siripattanakul,S and Sutthirat.C.H. 2011. Effect of soil water characteristic on simulation of nitrate vertical transport in a THAI agricultural soil. Sustainable Environment Research. 21:187-193. Eaton,A.D., Clesceri,L.S and Greenberg,B. 1995. Standard Method: For Examination of Water and Wastewater. Heatwole,K.K., McCray,J. 2006. Modeling potential vadose-zone transport of nitrogen from onsite wastewater systems at the development scale. Journal. Contaminant Hydrology. 91: 184–201. Jing,Q., Bouman,B.A.M H., Hengsdijk,H., Van Keulen,G and Cao,W. 2007. Exploring options to combine high yields with high nitrogen use efficiencies in irrigated rice in China. Europ. J. Agronomy. 26: 166–177. Mikkelsen,D.S., De Datta,S.K and Obcemea,W.N. 1978. Ammonia volatilization losses from flooded rice soils. Soil Science Societyof America Journal. 42: 725-730. Mitsui,S. 1954. Inorganic nutrition, fertilization and soil amelioration for lowland rice. Yokendo Press, Tokyo. 107. Ramos,T.B., Simunek,J., Goncalves,M.C., Martins,J.C., Prazeres,A., Castanheira,N.L., Pereira.L.S. 2011. Field evaluation of a multicomponent solute transport model in soils irrigated with saline waters. Journal of Hydrology. 407: 129–144. Simunek,J., Senja,M., Genuchten,M.T.h. 1998. The HYDRUS-1D software pakage for simulation the one-dimensional movement of water, heat, and multiple solutions variable-saturated media, Version 2.0. International Grorund Water Modeling Center-TPS-70. Colorado School of Mines, Golden, Colorado, 162. Tafthe,A and Sepaskhah,A. 2012. Application of HYDRUS-1D model for simulating water and nitrate leaching from continuous and alternate furrow rapeseed and maize fields. Agricultural Water Management. 113: 19-29. Teixeira,C.C., Magalhaes,R., Boaventura,A., Bordalo,A. 2011. Potential rates and environmental controls of denitrification and nitrous oxide production in a temperate urbanized estuary. Nitrate fate in a Marine Environmental Research. Agricultural Water Management. 70: 336-342. Thuyet,D.Q., Quoc Hien,T.H., Watanabe,H., Saito Khanh Phong.T.H., Nishimura,T. 2010. Micro paddy lysimeter for monitoring solute transport in paddy environment. Paddy and Water Environment. 8:235–245. van Genuchten,M.T. 1980. Aclosed-form equation for predicting the hydraulic conductivity of unsaturated soils. Soil Science Society of American Journal. 44:892–898. Wallach,R., Israeli,M and Zaslavsky,D. 1991. Small perturbation solution for steady non-uniform infiltration into soil surface of a general shape. Water Resources Research. 27: 1665-1670. Xu J., Peng,S.H., Yang,S.H., Wang,W. 2012. Ammonia volatilization losses from a rice paddy with different irrigation and nitrogen managements. Agricultural Water Management. 104: 184-192.